To order or get to price list page. You can have a Floatation Tank Center where the center of your business is the tank - usually 3 or 4 or more - with other services added. These places offer the best of environments. The atmosphere magnifies the clear spirit of those coming out of the tanks. It is a wonderful place to be. There's no shortage of people who want to come and do any job at all at a float center. We have a manual called,"So You're Planning a Center" for sale that is very good helping you plan a Center. If you don't know anyone who would like to float in a tank, this won't work. You have to know at least 2 people who would like to float in a tank for this to work. If you know 2 people who want to float, and let them invite their friends who would like to float, you can start a business. We see a network of these through out North America that we call "The Blue Highways". Floatation tanks for rent could soothe the continental nervous system while it helps the economy. In your own home you can provide a service which could change someone's whole life while you have the benefit of earning money and meeting excellent people. 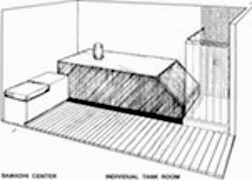 You do need a room that offers privacy for the floater and you have to be willing to keep the tank and the shower immaculate. We will supply the "Orientation", the "User Form", suggestions on promotion and lots of materials to help you. As far as being in the business, being someone when they come out of the tank is so much fun that it almost seems wrong to collect $40. or more/hour. But you can force yourself. You get to float at any hour of the day or night, for as long as you wish. and that is the supreme benefit. Visualize a network of these businesses linked throughout the world. Inner space highways, floatation stations, health hostels, peace! This can grow into a very strong, creative network with lots of room for growth. You can have a tank in many other business establishments. Think of a tank in a cafe where people come to spend time reading or writing or talking. Add a 1 hour float to the mix and it softens the atmosphere very nicely. The mood of a bookstore is highly complimentary to the mood of floaters coming in and out of the tank. An orientation could be put on a dvd, so that a floater could be introduced to the tank, if the bookstore staff is busy. Setting aside a little corner for the floater to go to after the float with some books to scan, seems perfect. This is much more obvious. There already are many water and relaxation activities and floating would attract more of the meditators and inner vision clients. Floating is such an incubator for the creative process that any business where the nature of the work feeds on creativity would host a tank very well. Go back to the list "This works well if you". and see how it can fit your life. The time is ripe now. Many parts of the world don't have a tank nearby for others to use. This may be a very good way for you to get into the business. Although it isn't necessary, it will make a big difference, if you can do it. Why? Between floats, the staff needs to interact with the floaters coming in and leaving. This is your important opportunity to connect with the customer and respond to anything needed to complete the float experience. The staff needs to be available to the floater rather than doing house keeping, and housekeeping is necessary if the floater travels from the tank to the shower. Many drips. Of course not everyone can do this. We did that in our home for 4 years with 2 tanks when we were first letting people float in 1973. However, if you can make it happen, it is extremely valuable. We write this manual for those of you who are thinking about going into the tank business or have already decided to go into the business. This is an unusual business, different in some ways than other businesses, so it is important to get information particular to this business. Joining the industry trade organization is a good way to get additional information. There are numerous instructional videos on the FTA web site. How to deal with the issues of health department approval. Most health departments are not familiar with floatation tanks. The FTA has documents to assist you in dealing with them. You do not have to be a member to access these. We learned that in order to describe the use of the tank, we had to describe an experience.The list of words we were using were doing just the opposite of what we wanted. Technical words either turned people off or sent them away. We took the assignment of finding a way to describe the tank that would allow people to see the tank as a common object, something familiar rather than something strange. We worked on this description for years, refining and changing the words to keep making it simpler. The following is what we came up with. The tank is a little larger around than a twin sized bed and chest high. It contains 10" of water to which so much epsom salts have been added, that when you get in and lie on your back, you are pushed to the surface so you float like a cork, weightless as an astronaut in space. There is a lightweight door that you can leave open, or if you want to get rid of the distractions of noise and light you can close the door. If you are in the tank business, or thinking of being in the business, I recommend that you monitor your conversations about floating very carefully so you see how others are responding to you. It is an invaluable exercise. The objective of this material is to give you information to help you be with people before and after they float. This information has been gathered over time and is a condensation of what we have learned in the course of introducing thousands of people to floating. We like to give the details about the tank needed to guarantee the safety and comfort of the user. We don't want to tell anyone what they "should" or "probably will" do, think, or feel in the tank. First of all we were taught not to "program" people by Dr. Lilly, and from experience we have seen that people coming to use the tank are extremely creative in their usage, and they know exactly what to do with their privacy. They come up with such fantastic travels of their own that it seems unfair to limit them. As you continue using the tank and introducing it to others, you may notice how different it is for each person and how difficult it is to describe the experience precisely in words. Although most of us know that tastes, opinions, likes and dislikes are all very personal and individual, we often are swayed by what we hear someone else say. Sometimes we question our own reactions if they are different from what we have heard before. Samadhi faces this issue - how to retain and care for the private and personal experience of using the tank and then find a way to talk about it to thousands of people so they can discover it for themselves, without our programming their experience. We think we have solved the problem by devising tools that allow the tank user to validate their experience without being violated, and the staff to grow by being continually receptive to other realities. The following materials are items in a tool kit. General purpose tools for your use. As you work with them, they will become more natural, effective and comfortable for you. Explore them and see how well they can work. Build with them. Be creative with them. Enjoy them. Find when they are appropriate and when they are not. Like the tank, they are for you to explore, learn and grow. Use these tools and you will become a valuable resource to people who in turn, will want to buy tanks, memberships, and packages from you, free of the traditional pressures of "salesmanship". Master these tools and put them to appropriate use and not only will your job become profoundly more interesting and far more fun, but more rewarding financially as well. The way you are with people both before and after their float can strongly influence what they think of their float. It also helps them decide whether or not they want to come back and float in the future. One of the things that has made Samadhi so successful is the way we treat people when they come out of the tank. It is so simple that it may seem as if we're describing the things you would do very naturally. Our premise is that everyone sees and feels the world a bit differently. A rainy day is beautiful to one and gloomy to another. Being at the top of a skyscraper can be thrilling to one and frightening to another. The way anything seems to an individual is not right or wrong, good or bad, it is simply the way it is for that person. We have learned that it is important to allow for these individual differences, to simply let people be. When some people get out of the tank, they may be so quieted or peaceful that they may not want to be distracted with socializing. Perhaps they have just had a personal discovery in the tank and want more quiet time to explore it. People often say that they don't feel like talking when they come out of the tank. It is similar to the way that some people don't feel like talking when they first wake up in the morning. It is just the way people are. Likewise, it is not at all unusual for people to be eager to talk. Many people feel that their experience isn't really complete until they have talked to someone about it. The important thing is to let everyone have the oppcrtunitv to talk and the choice of whether or not they want to talk. Some may prefer to sit quietly having some tea. That is quite common. If, on the other hand, a person does want to talk, we think it is extremely valuable to have someone there, ready and willing to listen. To really listen with understanding and interest, so that the person has an opportunity to fully express what he or she wants to say is the art to cultivate. Listening is the key to being with people when they come out of the tank. Listening so that the person feels they have been heard. Listening in a way that lets each person know that the way he or she sees things or thinks about anything is alright.Sometimes, merely repeating what someone has said lets them know they've been heard.Sometimes, a moment's silence gives another the time to work out their thoughts for themselves. That way they come up with answers to their own questions. This non-intrusive, quiet approach outside the tank matches the quiet self-reliance inside the tank. That's what makes it so natural and appropriate. It complements the tank experience itself. If you can simply listen to what people are saying, it may be the first time in their memory that anyone has ever heard what they were saying. This may be deeply appreciated by them and quite amazing for you. We encourage people to strengthen their sensing and intuition. In a gentle and nurturing way, we allow room for individual differences, rather than impose limits by telling people what their experience should be. We listen to people and give them room to explore their own thoughts and feelings without interference. We recognize that all points of view are valuable and interesting when seen as individual expressions of the overall richness of human experience. We welcome everyone coming to use Samadhi Tanks as having a unique viewpoint. We offer information about the known -- water temperature, floating, epsom salts, etc., while we honor the personal experience of the tank user. The range of responses to the tank we have encountered goes from ecstatic to bored. Whatever the response, it is okay. One problem that can occassionally arise is that because you are directly interested in the financial success of your Center, you will want people to talk about their experience only in ways that you think may seem to promote the tank. Thus, if a person tries to express something you think is negative -- such as, "I was cold in the tank" -you may find yourself tempted to resist their comments, explain them away, or cut them off prematurely. In such situations, it is useful to remember that people are not necessarily making comments about the tank, the Center, or about you when they talk about their experiences. They are talking about themselves. Hear them out and let them communicate whatever they're thinking. It will make them feel better and it will clear the path for them to move on and explore what they did like about the experience, to validate the positive aspects. Resisting people's "negative" comments and not hearing them only leaves them stuck in their negative feelings with no chance to resolve them. In addition to really listening to people, you will also want to be able to answer any factual questions they have. The list of questions and answers we have compiled elsewhere (see "Frequently Asked Questions") provides responses to questions that typically arise. Know them and use them. If people are asking you questions that aren't on the list, we have found that it is better to answer with an honest "I don't know" than to give wrong information. If, in addition to commanding factual information, you also have a backlog of your own experiences in the tank, and a continually growing knowledge of others' experiences, you will be even better equipped to serve the people who come in to float at the Center.